It’s about to be that time of year when everyone’s talking about what they’re thankful for. Tomorrow, we Americans celebrate Thanksgiving, and gratitude is simply part of the deal. Declare how much you appreciate your family and friends, and you’ll be rewarded with heaping portions of turkey, stuffing, cranberry sauce, and pie. Oh, so much pie. Thankfulness and pie are actually somewhat synonymous. The fact is, though (and we know you already know this, but we’re just reminding you), that gratitude shouldn’t be limited to one week or month of a year. There’s so much that all of us can be grateful for ’round the calendar, and feeling all of those appreciative vibes is actually as simple as just remembering that. Yep, it’s really that easy. 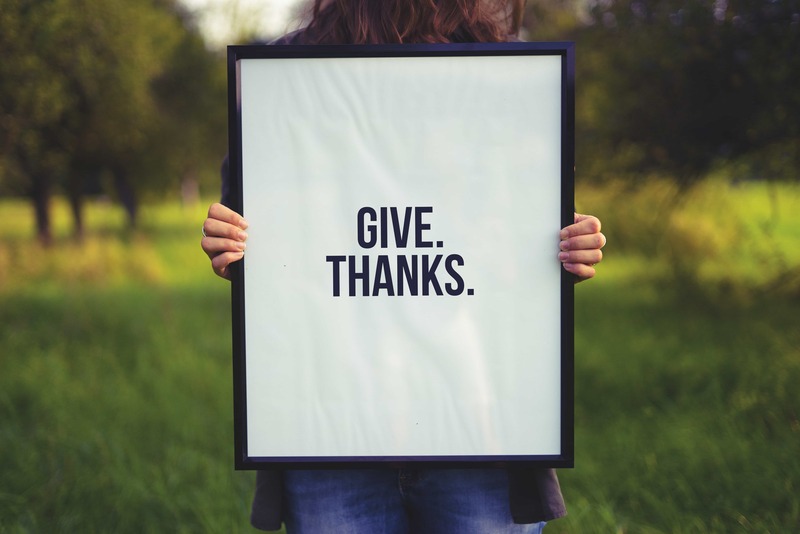 Let’s start by talking about ten things you’re already probably pretty grateful for, but that aren’t necessarily on your radar most of the time. 1. Good health: If you have a friend or loved one bravely battling a disease or other serious medical condition, we’re willing to bet that you already have a good perspective on how lucky you are to have your health — at least in a big-picture way. But it’s easier to forget on a daily basis how blessed we are to feel good in smaller ways. How fast do we forget how terrible it was to have a sore throat and stuffy nose? The minute our head cold clears! That’s called thankfulness, people. 2. Your sense of smell: It’s handy to be able to take a good whiff of something fragrant at any time of the year, but that trusty sense of smell feels like a gift more than ever during this season. Imagine suddenly not being able to take in the scent of a pine tree or baking cookies or hot mulled cider. You’ll take on a brand new appreciation for that nose of yours. 3. The people in your life with a good sense of humor: Everything here on Earth would be a little more boring and generally worse if we didn’t have opportunities to laugh along the way — and there would be no joking (or inside joking, which is obviously the best kind) without the hilarious people you surround yourself with. We’re not saying that funny people are your favorite people, but they probably are. 4. Your favorite song of the moment: We make our feelings about music pretty clear (check out our latest recommendations here), and while we’re actively grateful for it pretty much every. single. day, even we are sometimes unaware of how cool it is that at any given time, there can be one special song constantly playing in our heads, keeping us dancing and making everything seem better. That song — whatever it is (well, unless it’s really bad) — deserves a little more credit, don’t you think? 5. Your exes: Stop rolling your eyes and don’t you dare close this browser window. Whether you realize it or not, it’s your previous, not-so-great relationships that have empowered you to move beyond whatever crummy situation you once found yourself in so that you can be this stronger, wiser version of yourself. You might still be a work in progress — and you might even still be unhappily single — but you have your exes to thank for getting you to whatever next step you’re currently on. 6. Your ability to learn new things: What if your body and mind stopped picking up on all new information after your tenth birthday? Think of all the skills and abilities you would have missed out on! It’s pretty clutch that we get to be dynamic, ever-learning individuals, no? 7. The defroster on your car: It’s about to be winter, friends. Don’t lose sight of how major this is. 8. Your phone: It’s easy to write off our ever-present, always-buzzing devices as the thing that’s somehow ruined our society by conditioning us not to have good conversations with people IRL, but our phones offer us a lot of basic conveniences that many of us now take for granted. Instead of complaining about the group chats that just won’t quit or questioning whether or not your teenager really needs to snap another selfie, consider how lucky you are to have an alarm clock, a navigator, a calculator, and a convenient outlet for emergency calls right in the palm of your hand. 9. The ability to read: Even if you’re not really a “book person” (BTW, if you are a book person, you should check out the bulldog book club), you rely on your basic reading skills to take in pretty much everything around you: magazines, blogs, recipes, school calendars… even your Netflix recommendations. We’re super lucky to live in parts of the world where literacy is the norm, but that doesn’t mean it’s cool to take it for granted. 10. Movement: Whether you get your kicks from yoga, running, an intense weight room session, or regular dance parties, you know what a difference movement can make in your life. And even if your movement is limited — perhaps especially if it’s limited — you know that even the smallest flick or twitch of a muscle is worth appreciating. What are you especially grateful for this Thanksgiving season? Tell us on Facebook + Twitter!